Need to keep informed with live delivery updates & notifications? Wish you could arrange hire deliveries & pickups 24/7 on any device? 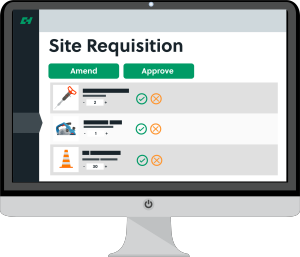 Like to empower your sites to raise orders but retain easy office authorisation? Want real-time visibility of your team's purchasing activity? Never want to forget to off-hire something again? Signing up gives you access to the online hire portal where you can view your equipment on hire, schedule customised reports, and view documentation. Brilliant, I can't fault the service it's outstanding. Excellent service. Your fitter was here at 06:50am yesterday, you've never ever not delivered. We've made a video explaining how you can take control of your tool hire using our new online platform. Your online portal is absolutely brilliant. So easy to use, saves paperwork, saves emails. Makes life so much easier.